Since floating the IPO in November 2017, Bluegreen Vacations Corporation’s (BXG) share price has come full circle. The stock opened its first day of trading at $13.55, rallied to a high of $25.91 in July and has since fallen back to $11.85 (as of 11/9). Although there are company-specific factors that precipitated the sell-off, the shares of nearly all publicly-traded timeshare companies have experienced similar losses so far in 2018. The industry-wide sell-off is probably due to two factors: (1) earnings growth for nearly all companies has fallen short of beginning year targets; and (2) there have been increasing concerns about an approaching slowdown in the U.S. economy, driven in part by rising interest rates. Price-to-earnings multiples (PEs) of timeshare stocks were high going into the year, due in part to expectations of strong (i.e. double-digit) earnings growth. Earnings growth has in fact been solid for most companies, but not nearly as strong as anticipated. The sell-off in timeshare stocks has been sustained by companies repeatedly missed their quarterly earnings targets. While timeshare stocks may have looked expensive to some at the beginning of the year, they now look cheap. The drop in share prices combined with modest earnings growth has reduced trailing 12 month PEs from about 22 times at the beginning of the year to just over 10 times currently. Although Bluegreen’s operating and financial performance in 2018 has clearly been driven by company-specific factors, it has also mirrored these industry trends. At the beginning of the year, I projected that BXG would deliver earnings of $1.50 per share. However, the company’s earnings have fallen short of the target with each passing quarter. I now anticipate that the company will post earnings of $1.20 per share in 2018 and $1.38 per share in 2019. Given management’s current expectations of more of the same in 2019, my 2019 projection may be somewhat aggressive. Bluegreen’s 2018 YTD Performance. As I described in some detail in my first analysis of the company, Bluegreen has built its business by developing and purchasing properties in “drive-to” locations, generally located within 300 miles of its members. Over the past decade, the company has expanded its market reach by selling the inventory of other timeshare developers for a fee and by partnering with organizations such as Bass Pro Shops and Choice Hotels to offer more vacation choices. With the economy picking up steam in 2017. Bluegreen seemed well positioned for growth. Its stock was cheap at the IPO price and the company looked like it was poised to deliver double-digit earnings growth for the next few years. My original 2018 earnings estimate of $1.50 per share represented growth of 36% from a 2017 base of $1.10. A big chunk of that increase came from the lowering of the corporate tax rate by the Tax Cuts and Jobs Act; but I also expected BXG to post solid gains in earnings and cash flow from its business. Bluegreen has expanded its operations modestly this year. In April, it acquired for $32 million the Éilan Hotel and Spa which is located in the foothills near San Antonio, TX. In May, it won a fee-based contract to manage the Marquee (aka 144 Elk Luxury Lofts), which is located in the theatre district in New Orleans. In June, it agreed to acquire the remaining timeshare inventory (on a “just-in-time” basis) of one of its existing Club Associate Resorts, The Manhattan Club in New York City. The company is expanding sales centers at eight of its properties, including the Éilan and the Marquee, which should help boost sales at these locations. It recently filled the newly-created position of Vice President of Business Development to focus on new marketing partnerships. This year, Bluegreen entered into a new partnership with the Florida Marlins baseball team and is working with Choice Hotels to expand Choice’s annual “cyber Monday” event to reach up to 10 million Choice Privilege Loyalty members. Bluegreen is also modernizing its ERP (enterprise resource planning) systems. This year, it has completed the installation of new point of sale and sales & inventory accounting systems. The company continues to test newly-created digital applications – for example, a system that will allow guests to book their stays online – that will augment its traditional marketing programs. Despite these accomplishments, BXG’s financial results have been disappointing this year (YTD through Sept. 30, 2018). 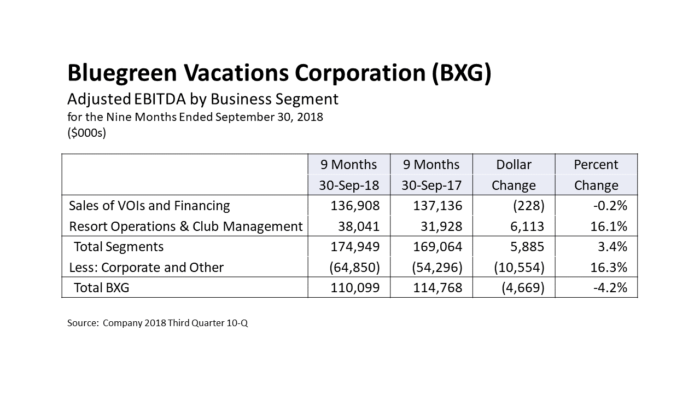 Adjusted EBITDA from its Sales of Vacation Ownership Interests (VOIs) and Financing segment declined slightly from $137.1 million to $136.9 million. Its Resorts Operations and Club Management segment has delivered strong growth in YTD adjusted EBITDA of $38.0 million, up 16.1% from 2017’s $31.9 million; but this was more than offset by a 16.3% surge in Corporate and Other Costs to $64.9 million. Year-to-date, total adjusted EBITDA is down 4.2% to $110.1 million. Sales of VOIs and Financing. With its large, nationwide operating base, Bluegreen derives revenue from the sale of VOIs in various ways including (1) from newly-completed timeshares properties that it develops or acquires, (2) from timeshares that it purchases in the secondary market (usually at big discounts) from homeowner associations or individual timeshare owners, (3) from timeshares purchased (usually in the secondary market) immediately prior to closing (i.e. on a “just-in time” basis) and (4) from fees or commissions earned from selling the timeshares of other developers. As a performance measure, the company tracks “system-wide sales”, which is the dollar value of all properties that it sells, whether owned by BXG or by third parties, minus the value of equity trade-in allowances granted to existing Bluegreen members. In the first nine months of 2018, Bluegreen’s system-wide sales were $478.1 million, up 2.3%. Bluegreen says that the decline in the number of guest tours is due to stepped-up efforts to target customers with higher FICO scores. Accordingly, while the number of guest tours was down year-to-date, the percentage of guests who actually bought a vacation package – i.e. the sale-to-tour conversion ratio – increased for total marketing guests from 15.8% to 17.0% and for new marketing guests from 13.1% to 14.5%. During this period, the percentage of sales to existing owners increased from 48.8% to 51.0%. However, conversion rates for just the 2018 third quarter for total and new guests declined by 0.2% (to 16.5% and 13.9%, respectively) vs. the prior year. Gross sales of VOIs increased 10.4% to $231.3 million in the 2018 year-to-date period. Gross fee-based sales, on the other hand, declined 4.3% to $246.8 million and the fees earned on those sales (which are booked as revenues by Bluegreen) declined by 6.4% to $167.6 million. Although the mix between owned and commission sales is influenced by supply and demand, Bluegreen says that it has the ability to determine the mix of sales based upon its own needs. For example, when it sees a rising level of timeshare inventory from its own resorts coming on to the secondary market, it will usually opt to focus on moving this inventory as quickly as possible to avoid an overhang, rather than pursue fee-based sales. (Net) sales of VOIs are calculated after the provision for loan losses. The provision for loan losses is determined by (1) an estimate of expected future defaults on notes receivable created in the current period plus (2) actual loan losses recorded on BXG’s notes receivable portfolio (that exceed the original loss estimates). For the first nine months of 2018, Bluegreen’s loan loss provision increased 7.6% to $35.9 million but declined as a percentage of gross sales from 16.0% to 15.5%. Yet, the percentage of VOI sales that were financed (i.e. not paid in cash within 30 days of the sale) increased from 59% to 61% and the average annual default rate on VOI notes receivable (on a rolling 12 month basis) increased from 8.07% to 8.41%. Consequently, I would have expected to see the loan loss provision increase by more than 7.6%. During the quarter, the delinquency rate on the portfolio ticked up slightly to 2.79% from 2.53% in the 2018 second quarter but was still below the 3.06% reported for the 2017 third quarter. Net sales of VOIs increased 9.9% to $195.4 million. Against this, the company recorded cost of VOI sales of $19.8 million, up 74.8% from the prior year. 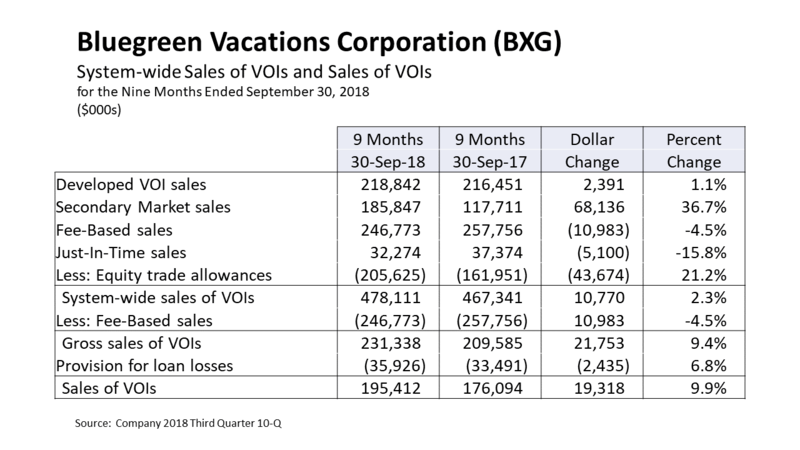 VOI cost of sales can vary sharply from quarter-to-quarter based upon the type of product and the size of the vacation packages sold, which can affect discounts offered to buyers. Net interest income from the notes receivable portfolio, which appears as “financing revenue” on Bluegreen’s income statement, declined 2.7% to $45.0 million. Lower financing income, due to the implementation of risk-based pricing (with borrowers with higher FICO scores now getting lower rates), and higher financing expense, due to this year’s rise in short-term rates, were the primary contributors to the decline. Also in the YTD period, Bluegreen incurred higher VOI inventory carrying costs and earned less from its title insurance operations. Selling and marketing expenses for the Sales of VOIs and Financing segment have declined this year both in absolute amount and as a percent of revenues because of the increase in sales to existing owners and the absence of a $3.9 million charge recorded last year to cover the company’s corporate realignment initiative. General and administrative costs have also declined this year, due to the absence of a $2.9 million severance payment accrual. Resort Operations and Club Management revenue increased 12% in the YTD period to $127.3 million, due primarily to the addition of the contract to manage the Marquee in New Orleans and the food and beverage and other operations of the recently acquired Éilan Hotel and Spa. Likewise, operating costs increased 9.8%, due to the additions of the Marquee and Éilan, as well as higher costs attributable to serving VOI owners. On a net basis, YTD operating profit increased 19.7% to $36.8 million and adjusted EBITDA increased 19.2% to $38.0 million. Corporate and Other Expenses increased 28.3% to $60.7 million due primarily to (1) higher executive and long-term incentive compensation expenses; (2) the increased legal expense associated with defending against lawsuits from certain members seeking to void their contracts; (3) higher self-insured health care costs; (4) higher depreciation expenses, due mostly to the ERP systems modernization; (5) executive severance costs; and (6) higher investor and public relations costs associated with being a public company. After several other line items, the impact of each of which was relatively small and mostly offsetting, Corporate and Other Adjusted costs increased (and their impact on EBITDA became more negative) from $54.3 million to $64.9 million. Cash Flows and Financings. Bluegreen’s 2018 year-to-date performance raises some concerns because its cash flow from operating activities (before cash paid for interest and taxes) declined by 20% to $91 million. Most of the decline was due to the large use of cash for changes in working capital. Some of that cash was used to acquire the Éilan Hotel and Spa, which was accounted for as an asset purchase. However, the company did not disclose how it allocated the $32 million purchase price to the various asset accounts (i.e. working capital, especially inventory, and property & equipment). Consequently, it is difficult to determine with precision the portion of the decline in CFOA (before interest and taxes) that is attributable solely to the company’s operations. The acquisition of the Éilan probably explains most of that CFOA decline. After the end of the quarter, Bluegreen completed a private placement of $117.7 million of timeshare-backed notes at an average rate of 4.02%, which refinanced $76.7 million of debt under its existing credit lines at a lower all-in rate. The $117.7 million securitization is backed by $135 million of notes receivable, which equates to an advance rate of 87.2%. After the repayment of the $76.7 million of debt, Bluegreen had $41.0 million to cover the (undisclosed) cost of the debt placement and the remainder was available for general corporate purposes. Summary and Conclusion. Bluegreen’s performance has been disappointing so far in 2018 and the ongoing fight with lawyers seeking to help certain members break their contracts has been a concern. Yet, the company appears to be making changes to its business model that should give it a more solid footing in years to come. Bluegreen’s decision to raise its required FICO score on new marketing guests and to risk-adjust its pricing on notes receivable (based upon the creditworthiness of the borrower) should help to ensure that it wastes less money on marketing to unqualified guests; so it should experience lower defaults over time on its new business. These efforts should also strengthen its customer contracts, making them less susceptible to lawsuits. Although there are clearly company-specific factors that have supported the sharp drop in Bluegreen’s share price, the selling appears to be overdone (just as it has across the universe of publicly-traded timeshare companies.) 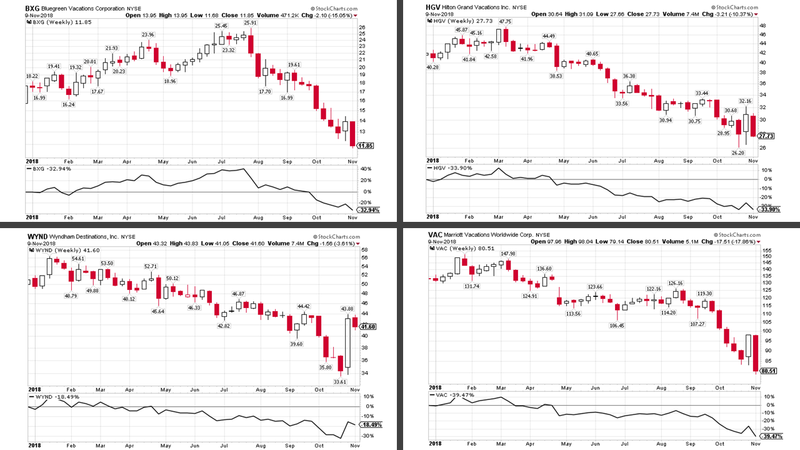 To the extent that the sell-off reflects market concerns about the negative impact of rising interest rates and a slowdown in the economy, it is possible that Bluegreen’s (and its peer group’s) shares have not yet seen bottom. However, assuming that the economic recovery will be sustained (as I believe it will for the next couple of years or longer), then Bluegreen’s (and its peer group’s) shares are likely to rebound in due course to valuation levels that are closer to market averages. For that reason, I believe that investors who are willing to establish a position here and ride out the potential volatility will eventually see attractive gains on their investment. In the meantime, with the latest decline, the stock now sports an attractive 5.1% dividend yield, which should be sustainable. This entry was posted in BXG, Real Estate and tagged Bluegreen Vacations. Bookmark the permalink.